This study aimed at studying the effects of shiftwork on health in nurses in Benha University Hospitals. Approximately one-fourth of hospital workers work in shift system. Shiftwork stress has been linked to negative effects on health. However, the studies on shiftwork effects are limited. This cross-sectional study targeted all nurses in Benha University Hospitals, Qualubeyia, Egypt, over the period from beginning of January 2014 to end of December 2014. The nurses completed Standard Shiftwork Index questionnaire and had a physical examination, including measurement of random blood sugar level, blood pressure for cardiovascular condition, and vital signs, especially pulse to assess arrhythmias, body weight, height, and BMI for obesity. The study recruited 803 nurses, and all of them were females; 43% aged more than 40 years, with a mean duration in shiftwork of 18.99 years. Most nurses were married. The surgical departments' nurses had significant higher BMI, digestive, and languidiness scores than medical departments' nurses. Both diastolic blood pressure and systolic blood pressure were higher in married nurses who had dependent households. Nurses who worked up to 40 h/week in night and afternoon shifts had a significantly higher sleep disturbance score. Cardiovascular score was significantly higher among nurses aged of at least 40 years, and who worked in shift system for 20–40 years; there were significant positive correlations between diastolic blood pressure and number of households and between cardiovascular problems and age and work duration in the shift system. Shiftwork was associated with health hazards, which mandated guidelines to protect nurses from the negative effect of shiftwork. The word 'shiftwork' is commonly used to describe irregular, odd, untraditional working hours, or working hours that are away from day work period . Shiftwork dates back to the late 1800s, as applied to guardians of old kingdoms and in the military services. After the innovation of the light, shift work expanded for nonstop production as in steel factories, iron foundries, and material plants . Approximately one-fourth of the workforce in hospitals works unusual hours (away from the traditional diurnal work period) . Shiftwork has a number of advantages and disadvantages to employers, employees, and their families . The advantages for employers include optimal use of energy, facilities, and other resources through extended capital operating time. The advantages for employees include increased income, more free time for daily activities, and saving time by avoiding traffic rush hours. Shiftwork is associated with both short-term and long-term disadvantages on physical and psychophysiological health. Short-term effects include fatigue and difficulties with sleep. Fatigue is a risk factor for workplace injuries and illness and may be complicated with a condition called 'Karoshi' which means death from overwork, which is now considered a significant occupational hazard and a legislative occupational disease in Japan, Korea, and Taiwan . Difficulties with sleep are found to be the most common complaint among shift workers. Sleep disturbances were the main reasons that led shift workers to leave night shiftwork owing to disturbed health habits compared with day workers . Gastrointestinal disorders were reported 2–5 times more commonly among shift workers than daytime workers. These disorders range from minor complaints (e.g., constipation, heart burn, distension, and disturbed appetite) to serious gastrointestinal disorders, which may develop into chronic diseases such as chronic gastritis or peptic ulcers . Shiftwork has been linked to type 2 diabetes and obesity as sleep deprivation activates the immune system and influences glucose metabolism . An association between shiftwork and cardiovascular diseases (CVDs) has been reported. There is a higher risk for CVD such as hypertension, subclinical atherosclerosis, and ischemic heart disease compared with daytime workers . Different types of cancer have been reported in shift workers including cancers of the breast, colon, and endometrium. Shiftwork system causes circadian rhythm disruption, which is probably carcinogenic to humans . Also, shiftwork causes disruption in both social and domestic lifestyle, which is a major consequence of shiftwork, especially with maternal employment that may have some adverse influences on their young children's cognitive and behavioral outcomes . In spite of shiftwork being common and shift workers representing a growing sector of the community, the number of studies in the area of shiftwork and related health hazards, especially among nurses, is limited. This study aimed to assess shiftwork-related problems among nurses working in Benha University Hospitals, Egypt. Type of personality: Identifies the different personalities such as evening, intermediate, or morning type, vigorous or flexible type, and neurotic or extraversed type. Physical examination was conducted on the study participants, which included measuring blood pressure for assessing cardiovascular condition and vital signs specially pulse for assessing presence of any irregularity or arrhythmias, body weight, height, and BMI to assess obesity. Also, a random blood sugar level was measured using a digital device to assess blood glucose level. A pilot study was undertaken on 10 nurses in Benha University Hospitals to test the applicability of the tool for data collection. The results of the data obtained from the pilot study helped in modification of the Arabic version of the questionnaire to improve the response rate. The results of the pilot study were not included in this work. The collected data were summarized in terms of mean ± SD and range for quantitative data and frequency and proportion for qualitative data. Comparisons between the different study groups were carried out using the Student t-test (t) to examine the mean difference between the two groups and the F test (F) to examine differences between more than two groups for normally distributed quantitative data, whereas the Mann–Whitney test (z) and the Kruskal–Wallis test (χ2) were used to test differences between two groups and more than two groups, respectively, for non-normally distributed quantitative data. Quantitative data were tested for normality using the graphical method (histogram) and numerical method (interquartile range: the presence of any severe outliers, points that were either three interquartile ranges below the first quartile or three interquartile ranges above the third quartile, was sufficient to reject normality). Pearson's correlation coefficient (r) and Spearman's correlation coefficient (ρ) were used to detect the correlations between the studied parameters regarding normally distributed and non-normally distributed data, respectively. A P value less than 0.05 was considered statistically significant. All statistical analyses were carried out in STATA/SE, version 11.2 for Windows (STATA Corporation, College Station, Texas, USA). The study population comprised 803 female nurses who were in the workforce during the period of the study (response rate = 74.9%). Of these, 371 (46.2%) were from medicinal departments, 300 (37.36%) from surgical departments, and 132 (16.44%) from outpatient's units. The age of the studied nurses ranged between 23 and 59 years, with a mean of 38.54 ± 10.16 years. Their shiftwork duration varied between 2 and 40 years, with a mean of 18.99 ± 9.42 years. [Table 1] shows the characteristics of the study population. [Table 2] shows the summary of the results of physical examination and Standard Shiftwork Index for the study group. Correlations between these results and potential risk factors revealed significant positive correlations of cardiovascular problems with age (ρ = 0.18; P < 0.001) and work duration in shift system (ρ = 0.17; P < 0.001). There was a correlation (ρ = 0.09) between random blood sugar levels in the study population and the number of partner's work h/week (P < 0.05). The number of household persons was correlated with diastolic blood pressure (DBP) (ρ = 0.08; P < 0.05) and anxiety scores (ρ = −0.08; P < 0.05). The number of paid overtime h/week was correlated with job satisfaction (ρ = 0.17; P < 0.01), whereas the number of unpaid overtime hours was associated with neuroticism (ρ = 0.10; P < 0.05), and the duration of career break was inversely correlated with social and domestic disruption (ρ = −0.17; P < 0.05). Univariate analysis [Table 3] revealed significant variations in BMI between nurses from different departments (P < 0.01), with the highest BMI among those who were working in surgical departments (29.2 ± 2.6 kg/m 2). There were significant variations in systolic blood pressure (SBP) and DBP by marital status, with the highest blood pressure among married nurses (P < 0.001). Also, higher SBP and DBP were recorded in nurses who had dependent households compared with those who did not (129.6 ± 15.7 vs. 124 ± 9.2; P < 0.05 for SBP and 84.3 ± 9.7 vs. 78.8 ± 5.7; P < 0.001 for DBP). SBP was higher in nurses who work for more than 40 h/week than those who work for up to 40 h/week (134.5 ± 15.9 vs. 129 ± 15.3; P < 0.05). [Table 4] shows that cardiovascular problems were more frequent among nurses who were older than 40 years, have been working for more than 20 years, and reported career breaks (P < 0.001). Job satisfaction scores and digestive problems showed significant variations between nurses from different departments (P < 0.05). [Table 5] shows significant differences in the overall coping scores between nurses with different educational level (P < 0.05). The anxiety scores were higher among nurses who had dependent households compared with those who did not (28.6 ± 4 vs. 27.2 ± 4.6; P < 0.05). There were significant differences in languidiness scores (P < 0.001) and neuroticism scores (P < 0.01) between nurse from different departments [Table 6]. Shiftwork stress and work-related stress are important topics in the healthcare sector owing to their possible negative effect on workers' health and safety. This includes CVD, gastrointestinal complaints, sleep troubles, mental health problems, fatigue, job dissatisfaction, accidents and injuries at work, reduced vigilance and job performance, absenteeism, and turnover . In the present study, 803 nurses staff working in Benha University Hospitals (response rate = 74.9%) were asked about their shiftwork and personal data to assess the effect of shiftwork on their health. The highest proportion (35.49%) of studied nurses reported that they accept working shifts for the higher rates of pay [Table 1]. In addition to the lack of daytime jobs available, evening and night work provides a unique source of gainful employment. Also shiftwork represented a second job to enable workers to increase their income . The mean BMI of the studies nurses was 28.84 ± 3.06 kg/m 2 [Table 2]. The association between overweight and shift workers was also reported in nurses and midwives in Poland . Shift workers tended to had higher BMI compared with day workers owing to the increased consumption of sugar-sweetened beverages and reduced night sleep. The mean SBP in the studied nurses was higher (129.32 ± 15.42 vs. 118.5 ± 14.6) than that reported in a previous study in Brazil . There were no significant differences in blood sugar levels by the different risk factors [Table 3]. Along with this, there was no significant association between hyperglycemia and shiftwork . In Upper Egypt, 61 (18.4%) of rotating shift workers at Abo-Korkas sugar factory in Minia were diabetics and seven of them were newly diagnosed . Also, diabetic workers accounted for 18.4% of shift workers in 'El Nasr for Tobacco and Cigarettes' factory, Giza, Egypt . The results of the present study showed significantly higher BMI among nurses working in surgical department compared with those working in medicine and outpatient departments [Table 3]. This can be because of less sleeping hours during their shifts as they are awakened frequently. It was stated that the relative risk of new-onset obesity was significantly higher for those with a short sleep duration of less than 5 h than for those with a sleep duration of 5–7 h .
[Table 3] illustrate high statistical significant difference at level P value less than 0.001 regarding high DBP among married nurses, with a mean of 84.5 ± 9.9, and with increased number of dependent households, with a mean of 84.3 ± 9.7. 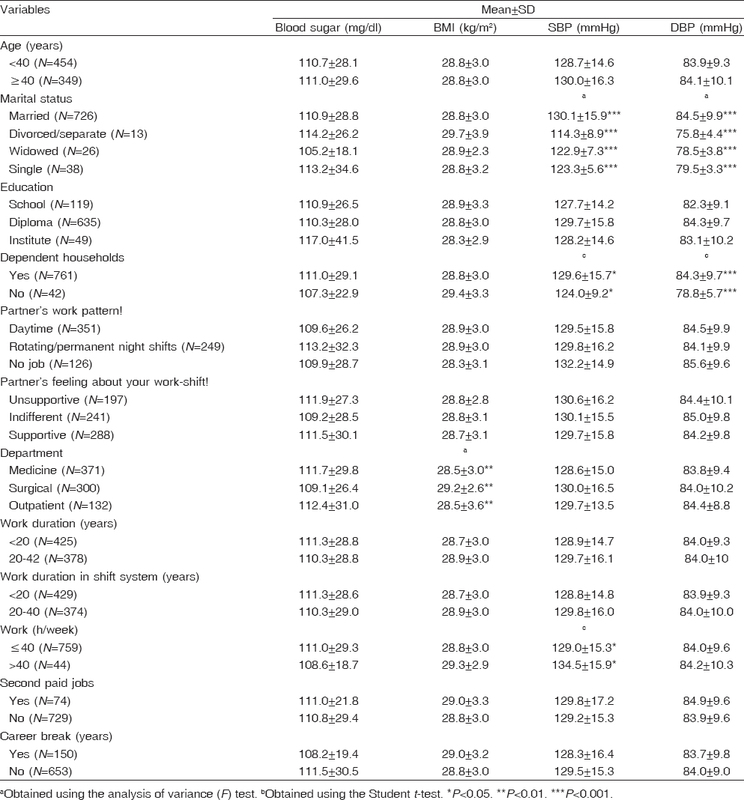 Married nurses were more likely to have high blood pressure particularly those who had dependent households [Table 3]. This can be because of working environment at hospitals where nurses have direct contacts with patient's day and night, so they are influenced by patients and their families' pain and distress. In addition, the necessity to do tasks immediately and accurately causes psychic pressure on employees as time passes. Also working for long hours, working at the weekends and night shiftwork, and sleep deprivation specially married nurses who have family load can contribute directly to blood pressure dysregulation via increased sympathetic nervous system and adrenocortical excitation leading to increased blood pressure, heart rate, and excretion of norepinephrine on the following day. This agrees with studies that were conducted on white collar workers showing mild hypertension correlated with cumulative job strain especially with women with low social support  The increased risk of adverse health conditions was reported in married women with young children compared with single women without children owing to the greater added load of marriage and children, which may cause role conflict and may negatively affect health, physical, and/or mental well-being . This study showed that nurses who work more than 40 h/week were more likely to have higher SBP compared with those who work up to 40 h/week [Table 3]. Correspondingly, SBP measurement was elevated for long-hours group as compared with short-hours group in Japan . Sleep disturbance was more likely among nurses who work for up to 40 h/week compared with those who work for more than 40 h/week [Table 4]. This can be because of high nonworkload, particularly because most studied nurses were married (90.41%) and had dependent households (94.77%). In this study, the job satisfaction scores were more likely higher in nurses in the medicine departments compared with those in the surgical and outpatients departments [Table 4]. This was also reported for registered nurses in Iran where medical ward nurses had significantly higher scores on job satisfaction items, such as the task requirement, autonomy, and work interaction subscales (P < 0.05), than nurses in surgical and critical care units . The present study showed no significant differences in the chronic fatigue scores by the different risk factors. However, chronic fatigue was associated with shiftwork compared with daytime work in the Netherland . The link between shiftwork and chronic fatigue was also reported. Also, there was a statistical significant relation between fatigue and young age group more than the older age group, as they have more adaptive measures to fatigue. 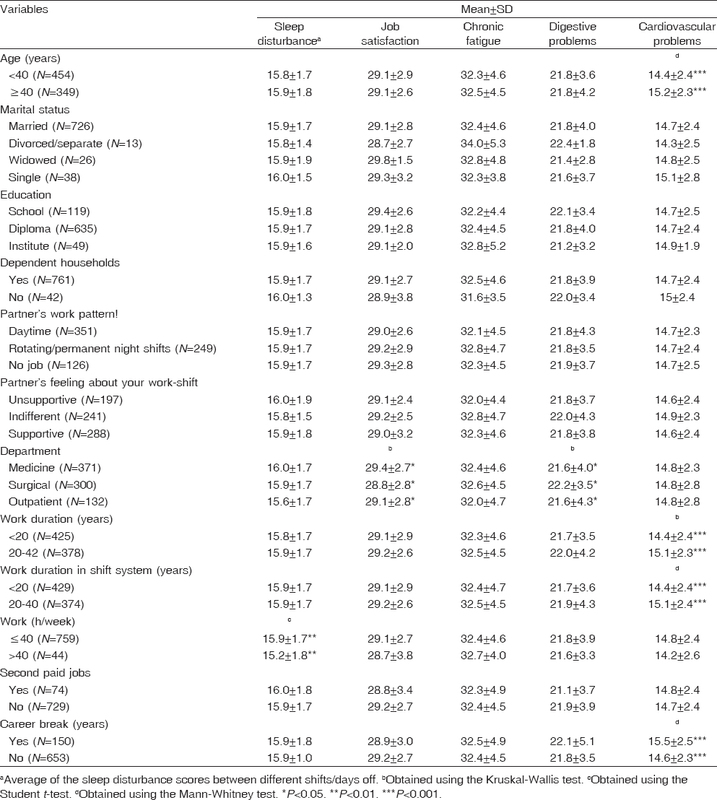 In this study, nurses who were working in surgical wards were more likely to have digestive problems [Table 4] compared with those in the medical and outpatients wards . The increased prevalence of digestive problems in nurses working in surgical wards can be explained by that a career as a surgical nurse requires long hours preoperatively and postoperatively and during surgical operations, stressful situations, and exposure to some of life's more unpleasant sights. So they may express this in bad digestive score. In this study, cardiovascular problems were more frequent in elder nurses who worked for more than 20 years and had career breaks. It is known and proved that aging and obesity reduce cardiovascular function, adding the risk of shiftwork especially night shifts. Similar results were reported in previous studies. The risk of hypertension and cardiovascular disorders was higher in nightshift employees of health sciences campus of a public university in the state of Minas Gerais, Brazil . 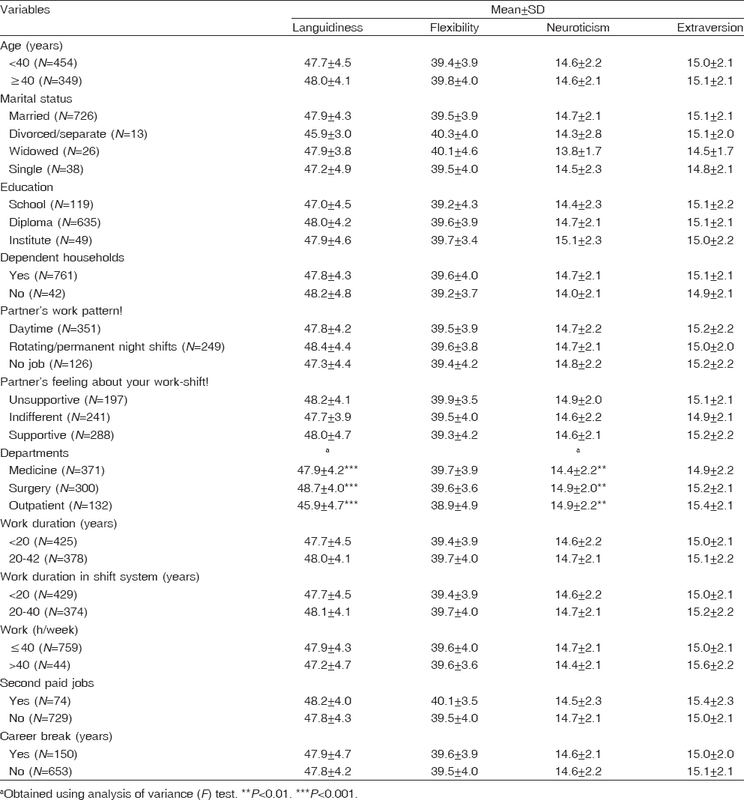 The results of this study showed that the mean total anxiety score was higher among nurses who did not have dependent households than those who had [Table 5]. This disagrees with a previous study which reported that having children was positively associated with the depression score in the survey of shiftwork, sleep, and health on Norwegian nurses . The increased risk of somatic and cognitive anxiety can be owing to female nurses having a particular challenge owing to their multiple roles creating a conflict and strain and resulting in negative psychological (and perhaps physical) health consequences. As they alter their family or social life to adapt to shiftwork commitments, it tends to report greater cognitive and somatic anxiety. In the present study, the inability to have children may be more troublesome to females in the Arabian culture. In this study, there were no significant differences in the social and domestic scores by the different risk factors. This comes along with previous results by  who reported that only a few petroleum workers reported that their shift schedule affected their social and domestic/family life and the participants had enough time to spend by themselves and with their partner, close family, friends, and children. 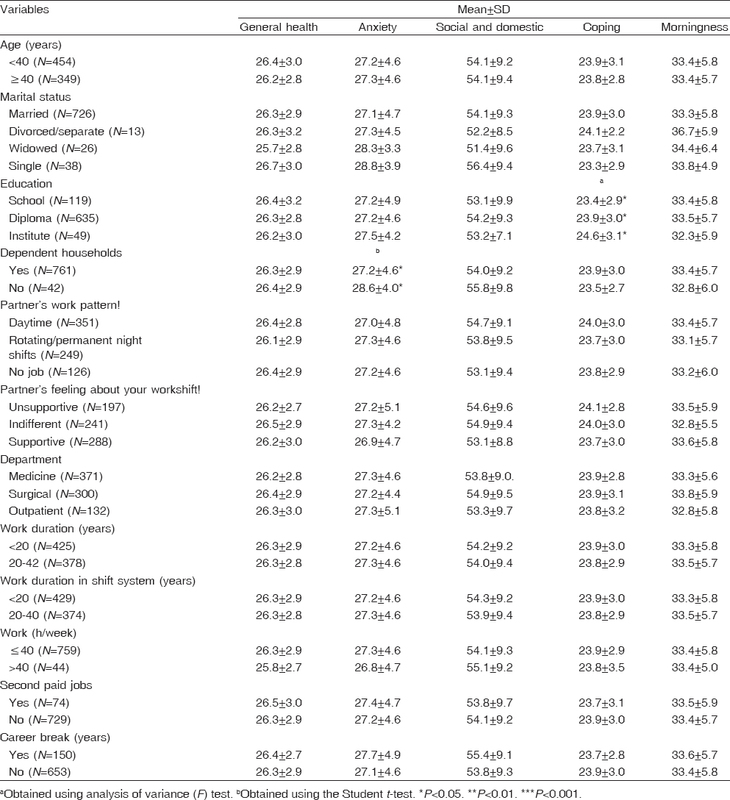 In this study, the overall coping scores were higher among nurses who had institute education compared with those who had only school or diploma [Table 5]. This can be due higher educational level, which enable nurses to cope and adapt more easily. Also expert nurses with longer working duration tend to have maturity and life skills that enable them to overcome problems and stress . The results of the current study revealed that nurses who were working in surgical departments were more likely to have significantly higher languidiness scores compared with nurses in medical and outpatient departments [Table 6]. On the contrary, flexibility was positively correlated with shiftwork duration experience on a longitudinal study done on rotating shift workers . Nurses in the medical departments had lower neuroticism scores than nurses in the surgical and outpatient departments [Table 6]. This can be owing to the high flow of patients at the outpatient clinics more than inpatient departments in a shorter limited duration and the high rate of urgent events at the surgical and emergency departments. A significant correlation (0.59) between neuroticism scores and shift work tolerance was previously reported . The results of this study showed significant positive correlation of age and work duration with cardiovascular scores which was expected as explained before. Blood sugar levels were correlated to partner's work h/week, which can be explained by overload more stress put on the nurse that is expressed as elevated blood sugar. The job satisfaction scores were correlated with paid overtime h/week, which can be because of increased income. However, the number of unpaid overtime h/week was correlated with neuroticism scores owing to more efforts done with no acknowledgement. Also, frequent overtime is associated with difficulties staying awake on duty, reduced sleep times, and nearly triple the risk of making an error . But, the statistical significant negative correlation to years spent in career break can be explained by that less working years means less work stress and less incidence of social/domestic problems. The main drawbacks of this study were the lack of a control group of who never practiced shiftwork and the cross-sectional design which might underestimate effects owing to healthy workers' effect. Further large scale controlled follow-up studies were recommended to better identify and qualify the adverse health effects of shiftwork. It can be concluded that shiftwork has been widely practiced particularly in healthcare, and a number of health hazards were associated with it, which mandated guidelines to protect nurses from the negative effect of shiftwork. Costa G. Shift work and occupational medicine: an overview. Occup Med (Lond) 2003; 53:83–88. Smith MR, Fogg LF, Eastman CI. Practical interventions to promote circadian adaptation to permanent night shift work: study 4. J Biol Rhythms 2009; 24:161–172. Beers T. Flexible schedules and shift work: replacing the '9-to-5' workday? Monthly Labor Rev 2000; 23:33–40. Cheng Y, Park J, Kim Y, Kawakami N. The recognition of occupational diseases attributed to heavy workloads: experiences in Japan, Korea, and Taiwan. Int Arch Occup Environ Health 2012; 85:791–799. Lowden A, Moreno C, Holmbäck U, Lennernäs M, Tucker P. Eating and shift work – effects on habits, metabolism and performance. Scand J Work Environ Health 2010; 36:150–162. Costa G. The impact of shift and night work on health. Appl Ergon 1996; 27:9–16. Spiegel K, Knutson K, Leproult R, Tasali E, van Cauter E. Sleep loss: a novel risk factor for insulin resistance and type 2 diabetes. J Appl Physiol (1985) 2005; 99:2008–2019. Knutsson A, Bøggild H. Shiftwork and cardiovascular disease: review of disease mechanisms. Rev Environ Health 2000; 15:359–372. IARC Working Group on the Evaluation of Carcinogenic Risks to Humans. Painting, firefighting, and shiftwork. Lyon, France: IARC; 2007. Han WJ. Maternal nonstandard work schedules and child cognitive outcomes. Child Development 2005; 76:137–154. Barton J, Costa G, Smith L, Spelten E, Totterdell P, Folkard S. The Standard Shiftwork Index: a battery of questionnaires for assessing shiftwork-related problems. Work Stress 1995; 9:3–30. Poissonnet CM, Véron M. Health effects of work schedules in healthcare professions. J Clin Nurs 2000; 9:13–23. Härmä M, Kecklund G. Shift work and health – how to proceed? Scand J Work Environ Health 2010; 36:81–4. Peplonska B, Bukowska A, Sobala W. Association of rotating night shift work with BMI and abdominal obesity among nurses and midwives, PLoS One 2015; 10:e0133761. Carla S, Sandra CF, Álvaro RM, Flávio DF. Shift work is not associated with high blood pressure or prevalence of hypertension. PLoS One 2010; 5:e15250. Osamu I, Yoshitaka K, Atsushi M, Eise Y, Takashi O. Association of onset of obesity with sleep duration and shift work among Japanese adults. Sleep Med 2011; 12:341–345. Ghazawy ER, Kamel SM, Gamal HM, Ewis AA. Night shift working and its impact on development and control of Diabetes Mellitus in workers of Abo Korkas sugar factory, El-Minia, Egypt. Journal of occupational medicine and toxicology 2014; 38:197–211. Ahmed Z, Frederic A, Mona S. The impact of work and family stress on workers' health. Bri J Appl Sci Technol 2014; 4:1869–1881. Guimont C, Brisson C, Dagenais GR, Milot A, Vezina M, Masse B, et al. Effects of job strain on blood pressure: a prospective study of male and female white-collar workers. Am J Public Health 2006; 96:1436–1443. Björkstén MG, Boquist B, Talbäck M, Edling C. Reported neck and shoulder problems in female industrial workers: the importance of factors at work and at home. Int J Ind Ergon 2001; 27:159–170. Iwasaki K, Sasaki T, Oka T, Hisanaga N. Effect of working hours on biological functions related to cardiovascular system among salesmen in a machinery manufacturing company. Ind Health 1998; 36:361–367. Atefi N, Lim Abdullah K, Wong LP, Mazlom R. Factors influencing job satisfaction among registered nurses: a questionnaire survey in Mashhad, Iran. J Nurs Manag 2013; 23:448–458. Jansen LG, van Amelsvoort TS, Kristensen PA, van den B, Kant I. Work schedules and fatigue: a prospective cohort study. Occup Environ Med 2003; 60 (Suppl I):147–153. Adriano MP, Gilberto K, Rafaela RC, Luciana Maria B, Salete Maria F. Night-shift work and cardiovascular risk among employees of a public university. Rev Assoc Med Bras (1992) 2011; 58:168–177. Nicolas MF, ØyaneSta LP, Bente EM, Akerstedt T, Bjørn B. 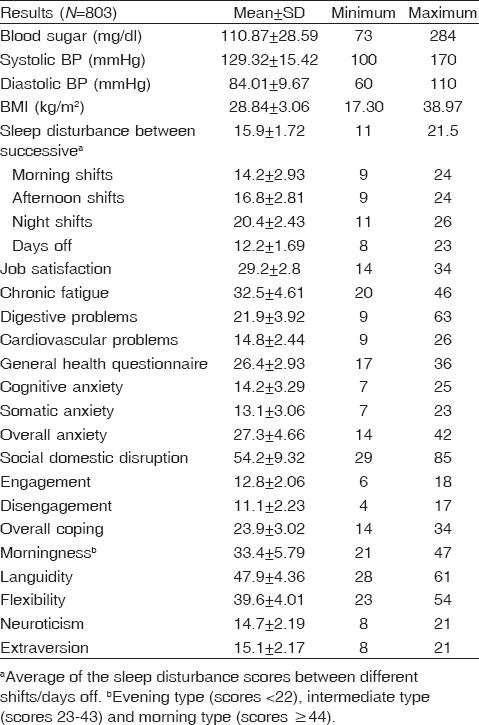 Associations between night work and anxiety, depression, insomnia, sleepiness and fatigue in a sample of Norwegian nurses. PLoS One 2013; 8:e70228. Cathrine HL, Bjørn L. Shiftwork in the Norwegian petroleum industry: overcoming difficulties with family and social life – a cross sectional study. J Occup Med Toxicol 2009; 3:4–22. Korompeli A, Muurlink O, Tzavara C, Velonakis E, Lemonidou C, Sourtzi P. Influence of shiftwork on Greek nursing personnel. Saf Health Work 2014; 5:73–79. Kaliterna L, Vidacek S, Prizmic Z, Radosevic-Vidasek B. Is tolerance to shiftwork predictable from individual difference measures? Work Stress 1995; 9:140–147. Iskra-Golec I, Marek T, Noworol C. Interactive effect of individual factors on nurses' health and sleep. Work Stress 1995; 9:256–261. Rogers AE, Hwang WT, Scott LD, Aiken LH, Dinges DF. The working hours of hospital staff nurses and patient safety. Health Affairs 2004; 23:202–212.